I am currently working with Keith Farrell and Ben Kerr of Triquetra Services, a 'charitable organisation with the mission to promote and further the study of European history through the medium of the historical, martial and creative arts' on documentary and portraiture related projects. Last Friday I photographed both of the gentlemen at the Glasgow University cloisters for a possible upcoming exhibition that is going to coincide with the Commonwealth Games in Glasgow in 2014. In the evening I went along to their meeting where I documented a longsword lesson as well as some traditional crafting and arrow fletching. The week before I also participated in their Scottish broadsword lesson (the sword featured in this photo). 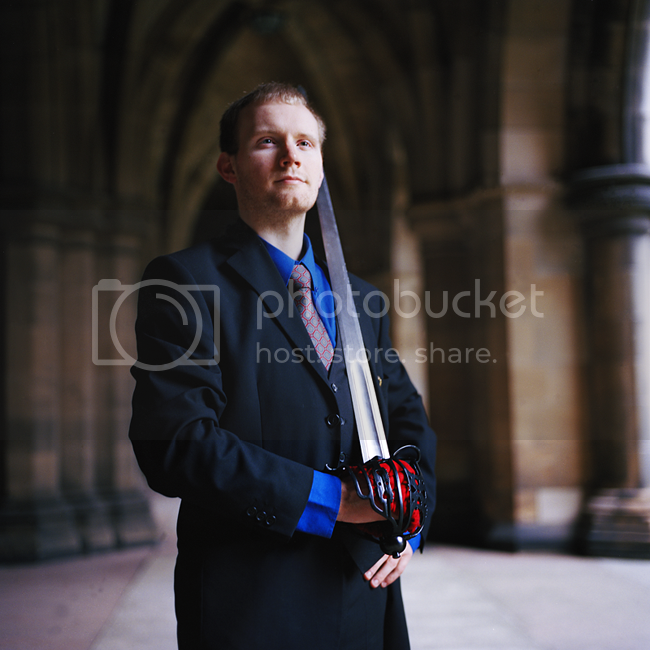 The Scottish broadsword is a unique weapon with a long history of fencing practice in Scotland. HEMA (Historical European Martial Arts) is widely practiced but unfortunately unrecognised as an official sport on the governmental scale. HEMA includes the study and practice of centuries old European swordsmanship and other combat techniques, usually derived from rigorous research on original manuscripts. Keith and Ben are currently both working hard to promote HEMA on a national as well as global scale, establishing proper disciplines in all martial arts, gathering teaching materials that could be used internationally as well as pushing for professionalism in the sport. The HEMA scene is currently facing challenges related to inconsistencies in teaching and rules, the separateness of training groups as well as modern knife and weapons laws that directly affect the practice of these traditions. With these portraits, as well as a wider documentary looking into the everyday life, successes and challenges of this group, I aim to raise awareness of European (with an emphasis on Scottish) cultural history by highlighting the devotion of these individuals in keeping ancient traditions alive. Please note that the activities I have listed above are not medieval re-enactment, or roleplaying, but rather an honest interest in real history and its application to modern life. I am looking forward to working more with everyone involved. Please check out the website above as well as the Adademy of Historical Arts and their blog, Encased in Steel. Huomasin saman aikasemmin ja vaihdoin ne vihreiksi mutta näkyy silti huonosti. Laitoin vielä vaaleemmiksi sitten!